Graham Williamson was born in Glasgow on 15th June 1960 and was one of the best middle distance runners the country has produced – Frank Clement was already on the scene when Graham and John Robson burst through to prominence in 1977 and 1978 but the rivalry between the three of them was as intense as that south of the Border between Coe, Cram and Ovett without any of the bad feeling. Graham, like many another before him was well known on the Scottish track and cross country circuits well before he was heard of in England. He had started running in Summer 1973 at the age of 12/13 with personal bests of 2:19 and 5:20.0 for 800m and 1500m. By 1974 as a Junior Boy his bests were 2:09.0 and 4:29.0 and his bests for the next three years are in the table. 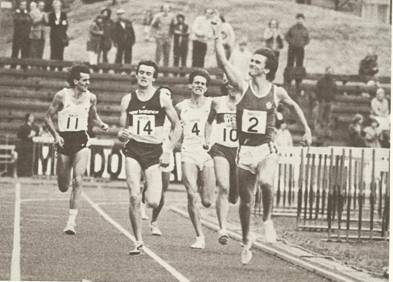 1977: First in Scottish Youths Cross-Country; 43rd in IAAF Cross Country (Dusseldorf); First in SAAA 800m, 1500m and 3000 metres; second AAA U20 1500m; Scottish Youth (U17) 800 and 1500m record holder. So, although John Keddie says that Williamson came into prominence in 1977 along with John Robson, he had been working his way through the age-groups, under the guidance of coach Eddie Sinclair since he was twelve years old! The first report in Keddies book says “In 1978, Robson had a brilliant run in the SAAA Championships in a memorable race. After a terrific duel with Frank Clement Robson just came out on top, 3:40.1 (a Native record) to 3:40.5. Not far behind these two was outstanding Junior John Graham Williamson (Springburn Harriers) whose 3:42.1 constituted UK aged 17/18 years old bests. Six weeks later these positions were exactly repeated in the UK Championships at Meadowbank. These performances augured well for the forthcoming Commonwealth Games at Edmonton for which, alas, young Graham Williamson, despite a record breaking win in the AAA’s Championships (3:39.7), was not selected”. When the list of incredible non-selections made by administrators is drawn up, this along with his disgraceful non-selection for the 1980 Olympics are sure to be at or very near the top. His win/loss record vis-a-vis Steve Cram was something like 21:1 in his favour but while the English selectors sent Cram along to gain valuable experience, the Scots left Williamson at home. But what must surely have given him most satisfaction was setting a World Junior record in Warsaw the day after the final of the 1500m in Edmonton. His time? 3:37.7.
and is a first class description of how the field came together, the wheeling and dealing about who took the pace, how fast it was to go, conversations between runners, the influence of Andy Norman, the conversation Brendan Foster had with Graham before the race and (of course) the course of the actual event. If you are interested in middle distance racing at this time and what ‘our boys’ are expected to put up with when they get to these events, this is a ‘must read.’ I’ll quote some of the bits of what Graham had to put up with here. The race already included Steve Scott, John Walker, Thomas Wessinghage and initially Ovett seemed a certain starter and the race was being organised by Andy Norman and Arne Haukvik of Norway. “Graham Williamson, only 19, had a best of 3:55.8 and been third in the Golden Mile the year before. For seven months he had had a tentative invitation to Oslo but there had been no confirmation. It seemed that with Walker and Ovett and Scott in the race, the promoters were waiting until the last minute to complete the field. They wanted the fittest runners and, because NBC-TV had bought rights to the race, a few Americans. “All year I’d been planning to make this race the peak of my year,” says Williamson. “I arranged three weeks of training at altitude in Colorado as final preparation.” He returned to Scotland 12 days before the race. “My training was going badly when I got home. One afternoon a week before the race I was out doing four miles and everything clicked.” That was the day that Norman called. “You’re in,” he said. They continued to put the field together – Robson and Moorcroft were kept waiting for their invite. Steve Lacy and Craig Masback (The two Americans) were also included. In Oslo no ‘journeyman rabbit’ could be included – it would have to be one of the runners. Masback was in no doubt that it would be Robson, Williamson or himself that would be required to do the job. None of them wanted it and Williamson made it clear that he wasn’t doing it. Then during an interview with the BBC Ovett said that with the strength of British Miling, why should they go all the way to Norway for a fast race? He boxed himself into a corner where it was not possible for him still to go to Oslo. Coe, who still seemed to regard himself as an 800 metres runner was in the field. “Back in the hotel, Williamson who had also resisted Haukvik’s entreaties to set the pace sat down with his room-mate, Brendan Foster, a magically astute judge of runners. Before them they had a ist of the field. “We got it down to Coe and Scott really,” Williamson says. “For a year I had felt that Coe was capable of a big mile, Coghlan had to be tired from his 5000, Walker was not at his best and Wessinghage seldom comes off well in a big race. I never expected anything of Masback.” The 19 year-old Williamson looked up at the 31 year-old Foster . “What do you think?” he asked. “I’d bet you third,” said Foster.” There was an interesting conversation with Walker and it was on to the race. Graham warmed up wearing two track suits. Lacy, the American, took the pace and came through the first lap in 57 seconds with Scott a yard back. They both got to 800 in 1:54 with Coe just behind in in 1:54.5. Two laps in 57 seconds each. At 1200 metres the time was 2:52.0. Coe moved off and down the back straight, “Williamson had found the race frustrating for its refusal to develop into a file of efficiently running men. “You could never settle in,” he said, “There were always things going on, people going past. I really only took stock of the race with 300 metres to go.” He was in fourth. “With Scott and Coe out and away, I was aiming for third. I got by Walker. I cut in on him and he pushed me in the back. Ahead Scott didn’t look that good. I began to think I might get second.” Looked good but then ………….. “On the turn, just past 1500 metres Masback loomed up just behind Williamson, and his reaching stride accidentally caught Williamson’s left foot. Two spikes came into the rear of the Scotsman’s red Puma and ripped it off his heel. “One second I was sprinting at Scott, thinking he’s not too far away’, says Williamson. “And the next ‘Christ, what can I do?’ I kept looking down. I ran a few steps with the back of the shoe tucked under my foot like a carpet slipper. Then I got it off. People began to go by me. My running action was gone.” Williamson would finish seventh in 3:53.2 – that and his 1500 metres time of 3:36.6 were European Junior records. The whole saga of the race is in Moore’s article. Then after all that hassle, just five days later Williamson easily won the AAA’s 1500 metres which he had won the year before in 3:41.6 and on August 16th won the European Junior 1500m in 3:39.0. A month later at altitude in Mexico City, Graham won the World Student Games title in 3:45.4: a really remarkable double. In 1980 there was a slow start to the season with early season illness. If the non-selection for Edmonton was a disgraceful decision, it did not compare with the ‘fix’ that was the selection for the 1980 Olympic Games. There was an Olympic trial for the 1500m in June. Graham ran and was second to David Moorcroft who said he wanted to run the 5000m in the Games. Ovett and Coe were clearly going and Graham as second in the trial should have gone. Steve Cram had fallen during the race and Brendan Foster persuaded the selectors to have Graham and Steve have a run-off for the Olympic place over One Mile at Bislett. Graham had a cold that week and asked the selectors to put the race back a week so that the two would have an equal chance. They refused. Then his bag containing his running kit, spikes and all, was stolen at the airport. He had to run with a cold and in borrowed kit. Needless to say he did not run to form in the race which was won by Ovett in 3:48.8 with Cram second in 3:53.8 and Graham some way back in 3:56.4. In his biography, ‘Ovett’ written with John Rodda, Steve has some hard words to say about the incident and I’ll quote some of them here. Steve was running in the 1500 at Bislett as were Cram and Williamson. “When I arrived in Oslo airport my thoughts of world-record breaking were quickly set aside for the plight of another runner, Graham Williamson. The young Scottish miler and Steve Cram had been pitched into my race to decide who should have the third 1500m place in the Games, in my opinion the most absurd way of choosing an athlete and an indictment of the selectors who could have had little understanding about the preparation and planning that goes into an athletes life. It showed a complete lack of feeling for the sport. If these selectors had been runners then they had completely forgotten what their sport was all about. To ask two young athletes to race in these circumstances a month before their Olympic event was like committing them to a duel at dawn: one of them was going to have a shattering experience. As we all waited at the airport it became clear that Graham’s kit was missing. I felt for the man as did the other athletes in the party. The prospect of having to run in different spikes, shorts and vest in such a crucial race was a cruel blow. A runners spikes are like a comfortable old pair of shoes – you will keep them until they are falling apart. I wanted to say something to Graham but I stopped short realising I would only make matters worse. In the event Graham’s gear did not appear and Cram finished in front of him and won the ticket to Moscow. Within a few seconds of winning the race I went over to Graham and tried to offer the right kind of words to comfort the guy. He had been running well, he thought he had done enough to win his Olympic place and then the selectors had turned round and said they had wanted more.” The book is excellent and I used to use particular paragraphs to illustrate points that I wanted to get across to runners and even at times to coaches. Exactly two weeks later at the same Stadium, Ovett set another world record with 3:32.1 for the 1500m while Graham ran 3:35.8 in fifth. 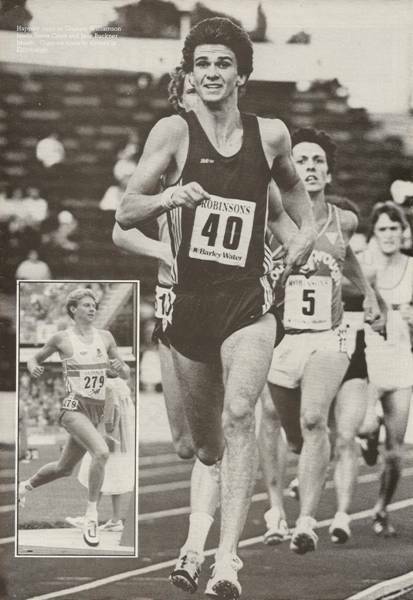 Injury prevented him from competing seriously in 1981 and the only mark for him in the SAAA Yearbook is 3:46.4 for 1500 metres in March that year. In 1982, however, he won the AAA’s indoor 1500m in January with a UK Indoor best of 3:40.72 which eh reduced further to 3:38.28 in a match against Belgium at Cosford ten days later. Into the summer season and he brought his mile time down to 3:50.65 for a National record when he was fourth behind the South African Sydney Maree at Cork on 13th July. He qualified for both the European and Commonwealth Games held later in the year. He had ten of the top 20 Scottish marks that year from 3:37.7 in Meadowbank in July down to a 3:46.1 indoors at Cosford in February. He won a top class 1500 in an international match at Meadowbank in July with 3:52.66 The match was against England, Poland, and Norway and he defeated the in-form Irishman Ray Flynn by almost two seconds. There was more misfortune in the Commonwealth Games in Australia however. He won his heat in 3:45.22 and was going really well in the final when there was a bit of a kerfuffle in the back straight of the final lap. Cram saw this and decided to take advantage and go for it. The result was a win for the Englishman in one of the tightest finishes imaginable. Result: 1. Steve Cram 3:42.37; 2. John Walker 3:43.11; 3. Mike Boit 3:43.33; 4. Graham Williamson 3:43.84; 4. Mike Hillardt 3:44.03. How close and how unlucky can you get? Well, the European Championships later in the year gave the answer. In the Final Graham accelerated past Cram with 600 metres to go before the Spaniard Jose Abascal caught his heel in the back straight and he crashed to the track. Cram won and Graham did not finish. 1983 and 1984 produced many of his lifetime best times with 1983 in particular showing best marks of 1:45.6 for 800m, 3:34.01 for 1500m, 3:52.01 for the Mile, 4:58.38 for the 3000 metres and 8:07.8 for the 3000 metres. The times for 800m, 1500m and 2000m were lifetime bests. He ran in the World Championships in Helsinki at the start of August and the BMC News had this to say of his performance: ” Graham Williamson gambled on not having lost too much conditioning with his injury but a 3:38.99 Heat was really all that he could manage in his condition. The man has talent and guts but never seems to enjoy much good luck. Still, he and George Gandy may well come through in 1984: Williamson can certainly run 800 in 1:44 and 1500 in close to 3:30, sometimes.” I like that ‘sometimes’ at the end! Graham was well liked and respected in the BMC and Frank Horwill liked the fact that he was not afraid to take it on if appropriate. In 1984 there were more excellent times recorded: 2:16.82 for 1000m, 3:34.13 for 1500m and 3:51.6 for the Mile. After these two outstanding years he was injured for most of 1985 and did not compete. There was a solitary 1500 metres time of 3:46.85 recorded in 1986 and, because of injuries, his wonderful career was basically over. The man who had been on the wrong end of several decisions by administrators and selectors was ironical given an extension to gain the qualifying time required for the Edinburgh Commonwealth Games. He couldn’t get within 7 seconds of the required time when he went for it in Innsbruck. His last lap kick had gone and he could only manage 63 seconds for it. In an article by Doug Gillon in ‘Scotland’s Runner’ for May 1987 he says”I knew then I’d had it. Yet it was the most consideration I had ever received from the Scottish selectors. He had retired by the age of 26. Graham had a fine career with many, many very good races and although most of the times were recorded approximately 30 years ago they stand up remarkably well today. He tops the Scottish Junior All-Time lists for 800m, 1500m, One Mile and 3000m. He ran for Scotland n the World Junior Cross-Country Championships (twice as a Junior and once as a Senior). His best marks are in the table which has his all-time GB as well as his Scottish rankings for each performance. BMC: Please describe in some detail your winter training and outline how it has progressed over the past three years. 1976/7: Sunday: 10 miles easy. Monday: 3 miles easy am; 800’s or speed work pm. Tuesday: 3 miles easy am; Brisk road run pm. Wed: 3 miles easy am; steady road run pm. Thursday: 3 miles easy am; Acceleration run pm. BMC: What are your views on the comparative values of indoor running and cross country during the winter? GW: I value cross-country running very much. It is a nice break from track running. I take the country very seriously but seem to get dogged either by very bad colds or injury at very important times. I have only won the Scottish National once. Twice in the last three years I have been undefeated and then got ‘flu one year and a very bad foot injury in 1978. BMC: Please describe in some detail your summer training and outline how it has progressed during the past three years. BMC: Please give details of training other than running. BMC: Please describe how you warm up. GW: At the moment I am trying different ways of warming up to see which one suits me best. I am trying different amounts of jogging and strides at different meetings. The warm-up depends on how long before the event you have to report. Normally at meetings I now start 45 minutes before the event. I just jog about during that time with about four or five ‘strides’ to loosen off and increase the heartbeat. My favourite Graham Willliamson story is of the wee boy (no more than 12 years old) who spotted Graham talking to Jack Crawford as he walked through the Springburn Harriers grounds at Huntershill and asked for his autograph. Graham was quite agreeable to this and asked if the boy had a pen he didn’t but borrowed one from Jack. He then asked for a bit of paper but the boy didn’t have one; he did however suggest that Graham sign his forearm and he would trace it on to a piece of paper when he got home!